Run-for-cover writing from scary places, by Junger (A Perfect Storm, 1997), a man with an appetite for the ragged edge of life and the ability to write about it with restrained power. The ten pieces in this collection of magazine articles, one of which won a National Magazine Award for Reporting, have the authentic tang of dispatches from the front. Junger might be considered a bit of an adrenaline junkie because of the situations he puts himself into, but as for being in someone’s gunsight: “there was nothing exciting about it, nothing even abstractly interesting. It was purely, exclusively bad.” What comes across here is the writer’s overpowering sense of awe at the events he describes. He writes with a pressure-cooker urgency, though with the lid firmly in place: no screeching high notes here, but the steady, awful thrum of things going out of control and death standing by. He tells of the intimations that smoke-jumpers feel when the woods they are in are about to explode into flame, and of the survival instincts followed by a man kidnapped with a group of trekkers by Kashmiri guerrillas who allow him alone to live. A good number of the pieces are situated in Kosovo, where the slaughter of Albanians by Serbians is without mercy or bounds. Most remarkable are Junger’s accounts of such places where all moral referents are severely out of alignment, having only hours before shifted from everyday life and begun a whirling descent into madness. Sierra Leone is a good example: being shot by a diamond-smuggling, AK-47–toting, drug-crazed teenager is just a daily precaution one guards against, like typhus or dysentery. 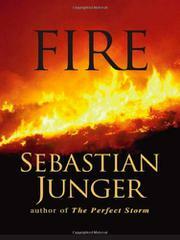 Deeply affecting stories of a ruthless world, natural and man-made, that will leave you stunned and distraught.